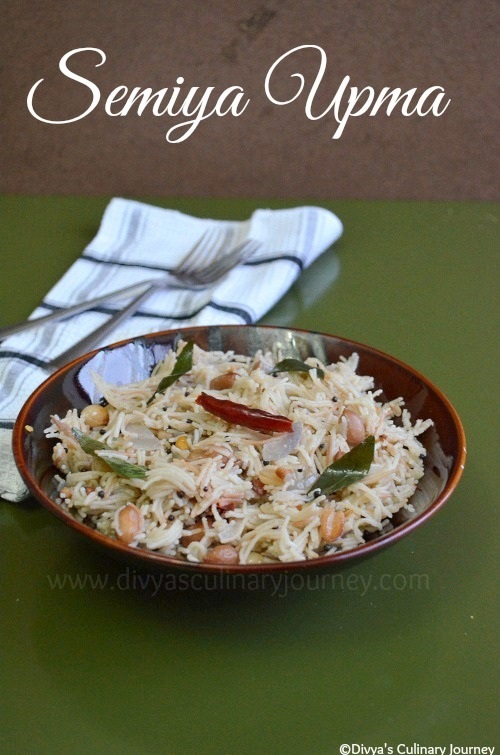 After posting all cakes and bakes, today I am posting a simple recipe, Semiya Upma / Vermicelli Upma. It is an easy and quick to make tiffin item. It is so versatile that it can be had for breakfast, dinner or even as a light meal. It is my favorite and my kids love it too. So I make it often at home. I sometimes pack it for lunch for my daughter too. Dry roast the vermicelli till it lightly start turning its color. Then turn off the heat and set it aside. In a skillet, heat oil, add mustard seeds, then add urad dal, chana dal and peanuts and roast till they lightly start turning the color. Now add the chopped onions, red chillies and curry leaves and fry till the onions turn translucent. To this add 4 cups of water and required salt and bring it to boil. Now add the roasted vermicelli and cook in medium flame till all the water is absorbed and the vermicelli is cooked. Now turn off the heat. Cover and let the vermicelli sit for few more minutes. If using now add lemon juice mix well and garnish with cilantro. Serve it warm. I have added red chillies here, instead you can use green chillies too. Adjust the green chilly quantity as per your heat tolerance level. Adding peanuts, lemon juice and cilantro are optional. But I recommend adding it. You can add vegetables to this upma too, to make it colorful and healthy. Yummy upma.. my favorite too. Happily Following you from my new blog..follow me back Divya. This is my favourite too but I don't add peanuts to it. Will try this version next time. Trying this out this week! Looks fantastic! 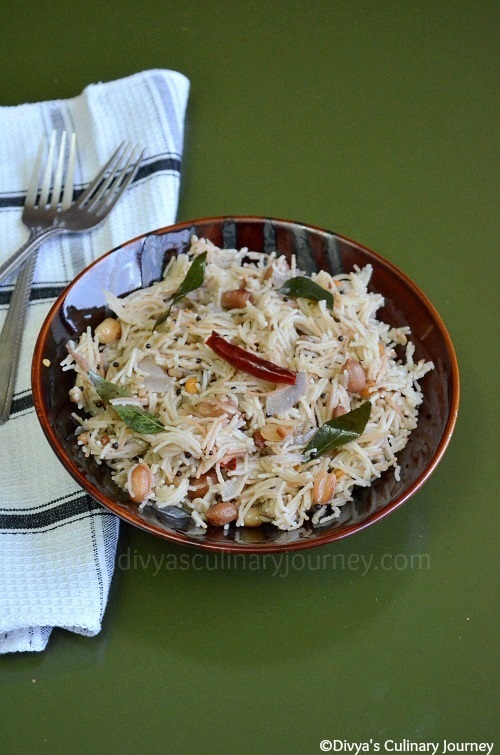 Even I like peanuts in this upma, makes it more tasty.. I packed this for my kids lunch box too, all time favorite. Easy and quick breakfast recipe.. Love the addition of peanuts.. Simple and delicious upma, love the addition of peanuts. very very delicious comfy food :) peanuts wud have made it more interesting :) looks super delicious dear ! !